i am looking for a script to rig a wheelloader in Unity3d. The special trait about the wheelloader is his steering. 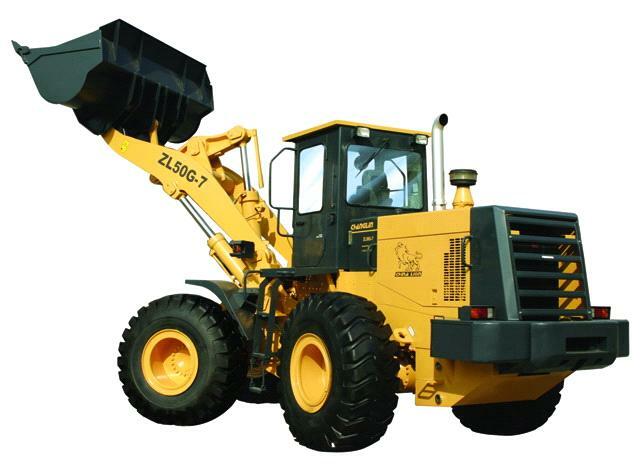 The wheels of the wheelloader do not rotat at thair front axis, the whole body of the wheelloader is bending. So, is there a rigging script in Unity which gets this feature. Hello Georg. Do provide more details. Is this an autonomous vehicle (something that will pick behavior and react to environment on its own) or for a player-controlled vehicle? UnitySteer is meant for autonomous vehicles that control themselves. As your vehicle is player-controlled, using UnitySteer would likely be overkill, however some of the functions included might be useful as a guideline on how to calculate forces. It'd start by looking at the SteerFor* behaviors, as well as OpenSteerUtility. There is no rigging script in Unity that will give you exactly that behavior, but they do give you the tools to create it yourself. You can start on the tutorials that Taiga linked to, as well as other questions tagged car. The important thing is for you to understand how the wheelloader is expected to behave, so you can replicate the behavior. @$$anonymous$$icardo: thanks, this becomes a journey for me, i will start today ... thanks for the tips!